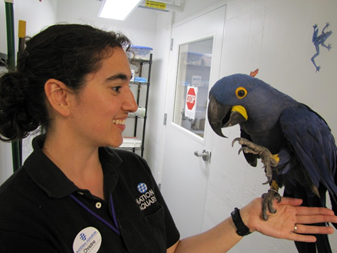 This month’s featured CPBT-KA (Certified Professional Bird Trainer - Knowledge Assessed) is Christine Behringer who is currently an Animal trainer in the Animal Programs Department at National Aquarium in Baltimore, MD. Christine says her favorite species to work with are Corvids. "I didn’t have a species or taxa in mind to work with when I started college, but that changed when I met Crow Baby. He was a non-releasable crow at the wildlife rehabilitation center where I was interning. Working with him made me fall in love with birds. The raven I worked with as a student at Moorpark College (Wakwa) was amazing and pretty much guaranteed that corvids would always be my favorites." Christine decided to get certified "mainly as a personal challenge. I’ve worked with a wide variety of animals across taxa, but I really enjoy working with birds. Getting certified was a way to build up more specific knowledge about birds, especially raptors, but also to show that I have a firm grounding in learning theory and training that would serve me well with any species I might work with." Getting certified "hasn’t changed too much with my day-to-day job. However, it’s given me additional resources to go to when faced with challenges and that gives me more confidence in dealing with those issues." Her advice for people thinking about getting certified? "Study smart! The reading list is great (I read just about everything on the list), but also think about yourself and what you know. For me, I don't have a lot of raptor experience, but I do have an education and training background. So I started out with the raptor books and left reading over the education material for the end. That way, if I didn't get to it or couldn't remember it as well because my brain was too full of other information, it was the material that was just a review for me." Want to find out more about setting these types of standards within your facility or becoming certified? Contact the IATCB board by visiting our website! Starting 2018 IATCB will no longer offer a heavily discounted re-take fee for those candidates wishing to take the examination. This special fee was introduced to encourage failing candidates to retake the examination, however, rising costs have lead us to this decision. If you take, but do not pass, the examination during 2017 we will honor the retake fee for the 2018 examinations. Note that to date IATCB has been absorbing fee increases from the testing company and we will endeavour to continue to limit the impact of cost increases on our fees. Are you signed up for the Fall Testing Cycle?! Application deadline for the Fall testing cycle is September 15! The testing cycle will run October 21 to November 4, 2017. Three (3) years of professional experience with birds, or membership at the professional level in the International Association of Avian Trainers and Educators. Completion and filing of an Application for the Certification Examination for Professional Bird Trainers. It may be possible to establish a special international test center for one or more candidates to take a paper and pencil examination outside of the United States. The CPBT-KA credential is valid for 5 years from the date it is awarded. To renew the credential a certificant must either re-take the examination after 5 years or accumulate sixty Continuing Education Credits (CEUs) by attending IATCB approved workshops, seminars, classes, or conferences. Head over to http://www.iatcb.com/staying-certified/ceu-events to check out a list of approved CEUs! Looking for CEUs you can register now for AZA - Principles of Program Animal Management. This course is designed for program animal managers and coordinators; education staff who utilize program animals; program animal and interpretive keepers; and museum professionals who handle live animals. This is a 30 CEU course. Still wondering if you should take this test? Head on over to http://www.iatcb.org/newhome and check out Erin Estell Katzner article “Certified Professional Bird Trainer – Knowledge Assessed. Darn, such a long title must mean I’m really good!” Erin is CPBT-KA, Avian Conservation Center of Appalachia and will give you her take on the test and studying! 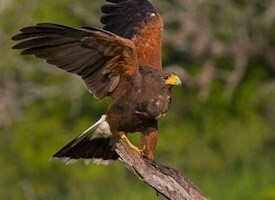 Harris' hawks can be found in semi-arid habitats in the southwestern United States and northwestern Mexico. Harris’s Hawk is a standout with bold markings of dark brown, chestnut red, and white, long yellow legs, and yellow markings on its face. Females weigh an average of 1,047 grams, and males are smaller, weighing an average of 735 grams. Both the female and the male contribute to parental care. Harris' hawks practice cooperative breeding, with several birds helping with building nests, incubation, feeding, and defense. This assistance increases nest success. They form complex social groups, which aid in the nesting cycle. These groups also hunt cooperatively. They are able to depend on much larger prey when hunting in groups. When hunting, a group of hawks surround their prey, flush it for another to catch, or take turns chasing it. This lifestyle, unusual for raptors, has earned them the nickname "Wolves of the Sky." They also exhibit an unusual behavior called "stacking." A single Harris's hawk will perch on a cactus, and 2 to 3 additional birds will stand atop his back. With a shortage of tall trees in their habitat, this behavior helps them to better see prey and predators. This hawk’s social nature and relative ease with humans has made it popular among falconers and in education programs. Harris's Hawks are not listed as threatened or endangered despite the fact that the population trend appears to be decreasing, the decline is not believed to be sufficiently rapid to approach the thresholds for Vulnerable under the population trend criterion. They are included in CITES appendix II and they are protected from harassment and illegal shooting by the Migratory Bird Treaty Act.